CONTEMPORARY books on inequality are divided into those published 'BC', or before 'Capital in the Twenty-First Century' by Thomas Piketty, or 'AP', for after Piketty. The 44-year-old French economic historian’s study of rising wealth and income inequality, which first came out in French in August 2013, caused a storm when it was published in English seven months later and became an international bestseller. The book did an excellent job of focusing people's minds on the subject. It also set the lines of empirical battle and even offered a possible remedy: a global tax on wealth. If Mr Piketty whetted the public's appetite for discussions of inequality, he also made it far more difficult for subsequent authors to say something new and original about it. That is unfortunate for Sir Anthony Atkinson, a British economist who has now written his own book. Sir Anthony, who is 70, has been working on inequality and poverty for more than four decades. He was an academic mentor to the young Mr Piketty and they worked together on building an historical database on top incomes. Mr Piketty's book sprawled over more than 600 pages, laying claim to the intellectual traditions of David Ricardo and Karl Marx and serving up a neat, all-encompassing (if controversial and widely challenged) theory of long-run inequality. Wisely, Sir Anthony has chosen a more digestible approach; 'Inequality' is quieter, shorter and more direct. Whereas Mr Piketty offered long ruminations on Honore de Balzac, Sir Anthony's is a crunchy book that analyses policy discussions in detail but avoids dullness, thanks to its unapologetic support for aggressive government intervention. In the event, Sir Anthony is more radical than Mr Piketty; he calls for robust taxation of the rich whom he reckons have got off easily over the last generation (see chart). But that's not all. He believes government should meddle in markets in all sorts of ways to influence the distribution of economic rewards. Sir Anthony's recommendations are a throwback to the 1960s and 1970s, when trade unions were a dominant force in politics and the state was seen as a much-needed check on markets. Even the most egalitarian economists, such as Mr Piketty, are reluctant to recommend employment guarantees and wage controls. Sir Anthony is not. And if his arguments are not always wholly convincing, he may nonetheless succeed in shifting the debate. 'Inequality' begins with a clear statement of the harm done by rising income gaps: they unfairly punish those who suffer bad luck. They undermine economic growth and social cohesion. Perhaps most importantly, inequality in economic resources translates directly into inequality in personal opportunity. Wealth generates comfort even when it isn’t being spent; the rich enjoy the fact that they are insured against future hardship or could use their wealth in future to satisfy personal or professional goals. The book then turns to the data and describes a familiar distributional picture. 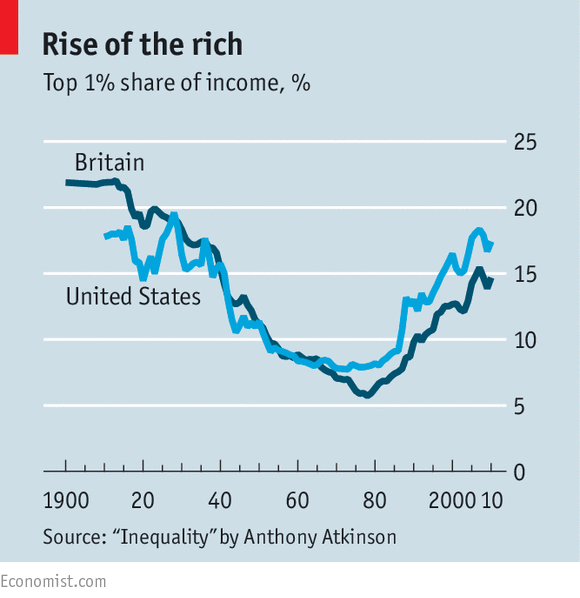 Inequality across rich countries was high before the two world wars of the 20th century. It fell to striking lows after 1945 and then began growing again around 1980 (see chart). Rising income inequality is a feature of most rich countries, especially America and Britain, and parts of the emerging world, including China. Sir Anthony is not interested in outlining any fundamental economic rules. Instead he carefully walks the reader through the ways that different forces have pushed incomes apart historically. In America, for instance, incomes at the top of the scale began pulling away from the rest quite soon after 1945. Yet household inequality - taking account of taxes and transfers - did not rise until what Mr Atkinson calls the 'Inequality Turn' around 1980. Several factors contributed to this, including changes for women and work. After the second world war, when female labour-force participation grew rapidly, high-earning men tended to marry low-earning women; the rising numbers of working women reduced household inequality. From the 1980s on, by contrast, men and women tended to marry those who earned like themselves - rich paired with rich; rising female participation in the workforce exacerbated inequality. Sir Anthony dwells on one class of contributory factors above all others: the subtle (and not-so-subtle) ways the rich are able to influence government policy in order to protect their wealth. When governments prioritise low inflation over low unemployment, or low taxes over investment in infrastructure or education, they are responding to the preferences of the rich. Rising top incomes (and stagnant low ones) are partly caused by long-running trends like globalisation and technological change. But people should not take those trends, or their consequences, as given, he argues. Government plays an important role in shaping the direction of technological change; autonomous vehicles, which may eliminate millions of jobs for less-skilled workers, owe critical technologies to research sponsored by the American government. A government in which workers' voices rang louder might, instead, have directed research funding into factory technologies that complement the skills of blue-collar workers. The state should be conscious of its role in the innovation process, Sir Anthony says, and take account of its effects on income distribution. In particular, it ought to invest in human capital - in education and training - and emphasise the advantages of human interaction in the administration of public services. The ability to file tax returns online is a boon to the rich, but the need to file benefit applications online may be a burden to the poor. Employing people to help the poor understand what they need to do to obtain benefits, for example, would mitigate the unbalanced effect of technology in two ways, he says: by reducing the socially isolating effect of technology on those applying for benefits, and by creating public-sector jobs. Sir Anthony believes that the responsibility of the state goes well beyond investing in training. He outlines 15 proposals that would boost egalitarianism, including setting a minimum wage and a suggested maximum at a multiple of the minimum. He would reinvent social security as a basic 'participation income' paid to all those deemed to be contributing to society (through work in the market or public service). And he would provide guaranteed employment, in the public sector if necessary, to those who want it. He reckons that if willing workers can be given useful tasks (like guiding the poor through benefit applications), then it should not matter whether the employment provides skills valued by the private sector - or indeed, whether the worker ever goes on to take a non-public job. The radicalism of the author's policy proposals makes it tempting to write them off. Some deserve to be. Putting distributional concerns front and centre in competition or innovation policy is a good way to raise the cost of goods and services, from broadband access to home goods, for the very low-income households that Sir Anthony is trying to help. Deregulating telecoms may lead to reduced employment in the affected firms, but poor households that enjoy cheap mobile services as a result might nonetheless be grateful. His instinct to limit the power of entrenched interests to manipulate markets is a good one, but it often strays into a broad distrust of markets in general, which is not. The author does not mind speaking uncomfortable truths. Among them: that the comfort and opportunity provided by wealth matter just as much as the consumption that wealth affords; that holding down a job may not be enough to provide most workers with a standard of living that keeps up with economic growth; and that economic power helps protect itself in subtle and pervasive ways which might well demand an interventionist government response. Sir Anthony's answer might not be the right one. But if his book reminds the reader how far out of fashion the policies of the post-war decades have fallen, it also conveys how skewed the economy of today might look to an observer from the not so distant past—or, perhaps, from the not so distant future.